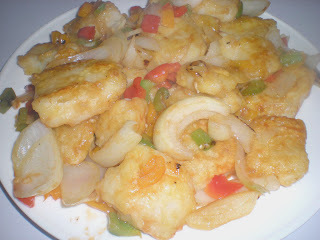 This is another fish dish that my Taiwanese friend made on the same night as the Red Cooked Tilapia. In Chinese cuisine, in order to make a sweet and sour dish, generally the main ingredient is deep fried and then coated with the sweet and sour sauce. 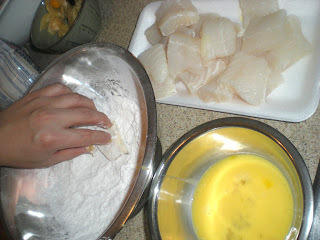 In most time, a batter is made for deep frying but he didn't made any fancy batter for the fish, simply an egg-flour dip. 1. Season fish with salt and pepper. Dip fish in egg and let drip back into bowl. Coat with flour. 2. In a skillet, pour enough oil to cover the bottom. Heat oil over medium-high heat. 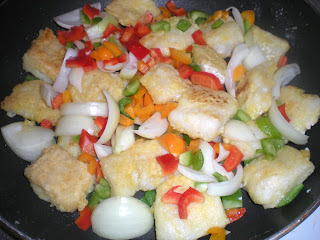 Fry fish until golden brown about 2 mins per side. Transfer fish on paper towel and keep warm. Remove oil from skillet. 3. In a large skillet, heat oil over medium-high heat. Cook bell peppers and onions until soft, about 5 mins. Remove from heat. 4. To make the sauce, combine vinegar, sugar, salt, orange juice, pineapple juice and ketchup in the same skillet. Bring to a boil and simmer for 10 mins. Mix cornstarch with a few tbsp of the liquid to make a slurry. Pour slurry to the skillet and stir until thick. 5. 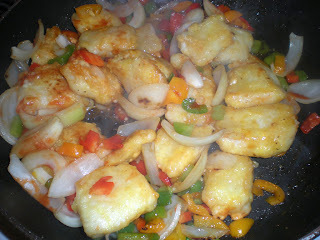 Bring back fish, bell peppers and onions to skillet and coat well with sweet and sour sauce. Serve with white rice.